Vein of Galen aneurysmal malformations (VGAMs) are rare congenital vascular malformations that may present with high-output cardiac failure and multiorgan dysfunction in the newborn period. Most of these patients have huge VGAMs that are associated with the “vanishing brain syndrome” (VBS) and very little can be done for these patients. However, a small number of these patients do not have VBS and aggressive treatment with endovascular embolization may be life-saving in such patients. It is important to preempt this diagnosis as intravenous iodine contrast used for doing a computed tomography (CT) scan leads to severe brain damage in these children and it is important for the neonatologists to know when to suspect the diagnosis and how to manage. Untreated VGAMs in neonates with heart failure carry a grave prognosis with almost 100% mortality in the absence of intervention., We report a neonate who had presented with cardiogenic shock due to a VGAM and was salvaged with emergency endovascular embolization. The purpose of this report is to highlight the above-mentioned nuances that are vital to save such babies. A term baby was born by cesarean section in good condition with a birth weight of 3 kg. The baby had been antenatally diagnosed with VGAM by fetal magnetic resonance imaging (MRI) done at 32 weeks of gestation. Unfortunately, despite the intrauterine diagnosis, the baby was sent home after delivery. The child remained asymptomatic for the first 5 days of life. At 6 days of age, she developed acute onset respiratory distress followed by poor feeding and lethargy. There was no history of associated fever, cyanosis, or convulsions. She was intubated and mechanically ventilated in view of severe respiratory distress at the site of the first contact and then transferred to our center for further management. On examination, she was found to be in shock with prolonged capillary refill time, tachycardia, mottling of the skin, cool extremities, and decreased urine output since the onset of symptoms. Arterial oxygen saturation was 98% on complete ventilatory support. The cardiovascular examination was notable for the presence of a third heart sound with normal splitting of the second heart sound. No murmur was heard. All peripheral pulses were poorly felt. There was no difference in pulses in upper and lower limbs. Gross hepatomegaly was present. The anterior fontanelle was open and pulsatile; however, no cranial bruit could be heard. There were no dysmorphic features and the other systemic examination was unremarkable. Arterial blood gas analysis showed severe metabolic acidosis. Laboratory parameters showed thrombocytopenia, deranged coagulation parameters, prerenal azotemia, and severe transaminitis. The chest radiograph [Figure 1]a confirmed cardiomegaly with increased pulmonary vascularity. The electrocardiogram showed sinus tachycardia with biventricular hypertrophy. Bedside echocardiography showed normal cardiac anatomy with increased flow velocities in the ascending aorta and the neck vessels that were dilated. The arch arteries and the descending thoracic aorta showed prominent pan-diastolic flow reversal. The superior vena cava was dilated and showed continuous signals. Moderate pulmonary artery hypertension was noted. A bedside cranial ultrasound examination [Video 1] showed a midline dilated sonolucent channel in the quadrigeminal cistern draining into the straight sinus through dilated falcine sinus. Doppler ultrasound examination showed both arterial and venous waveforms, suggestive of arteriovenous malformation of the vein of Galen. No hydrocephalus or intraventricular hemorrhage was noted. Noncontrast CT scan of brain reconfirmed the diagnosis [Figure 2]a. The baby was managed with ventilatory support, inotropic agents, diuretics, fresh frozen plasma, and platelets along with parenteral antibiotics. There was recovery from shock with gradual improvement in renal and hepatic function. However, coagulopathy was persistent. Following a difficult period of stabilization, digital subtraction angiography of head and neck [Figure 3] was performed on day 12 of life which showed a mural type of VGAM fed by posterior choroidal arteries primarily, with possible feeders from anterior choroidal arteries. A large venous sac was also present. 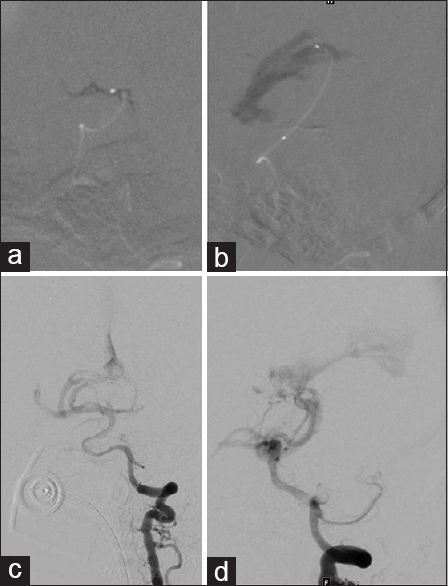 Transarterial embolization of two major feeding vessels from the posterior choroidal arteries was carried out with 10% glue [Figure 4]a and [Figure 4]b. The remaining feeding vessels could not be negotiated. However, the control angiogram showed spontaneous closure of these feeding vessels with 90% obliteration of the venous sac [Figure 4]c and [Figure 4]d. Fifteen milliliters of nonionic contrast was used during the procedure. Heparin 100 U/kg was given after femoral artery puncture and ACT was maintained over 250 throughout the procedure. However, use of a 5 French sheath and prolonged procedure led to right femoral artery thrombotic occlusion. Anticoagulation with heparin was given for 86 h with monitoring in view of persistent thrombocytopenia. Partial resolution of the thrombus with establishment of biphasic flow was achieved. Systemic thrombolysis was not attempted due to the presence of coagulopathy and to avoid the risk of bleeding into the recently occluded intracranial vessels. There was gradual resolution of heart failure with significant decrease in cardiomegaly on serial chest radiographs [Figure 1]b. 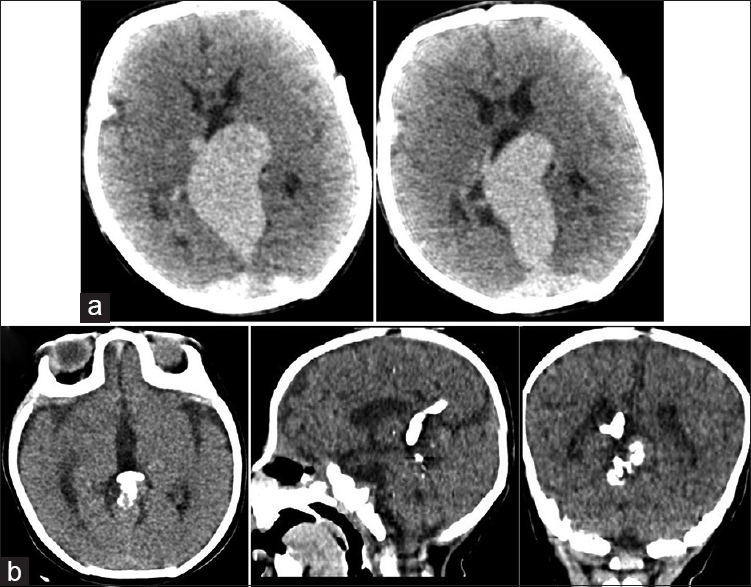 Follow-up noncontrast CT of head [Figure 2]b done a week after the embolization showed marked reduction in the size of the venous sac. The child is 3 years old now and is growing adequately with timely achievement of developmental milestones. VGAMs are rare congenital intracerebral arteriovenous shunts affecting neonates and infants. Although VGAMs constitute only 1% of intracranial vascular malformations, overall, they represent about 30% of all vascular malformations in the pediatric age group. VGAMs result from the persistence of an embryonic vascular structure, the median prosencephalic vein (MProsV) of Markowski that normally regresses by the 11th week of gestation except for its caudal end representing the actual vein of Galen. Direct arteriovenous connections between this venous structure and feeding vessels from the cerebral arterial network give rise to VGAMs. Depending on the degree of shunt, the MProsV, which lacks a fibrous wall, dilates and becomes an ectatic midline structure. Thus, the term VGAM is a misnomer since it is the MProsV rather than its caudal end, the vein of Galen, which actually drains the shunt. VGAMs are of particular interest to the pediatric cardiologist since these neonates often present with cyanosis and heart failure. The high-output heart failure is associated with pulmonary hypertension due to excessive pulmonary blood flow with or without cyanosis due to shunting across patent foramen ovale. Onset of symptoms in the neonatal stage is associated with multiple arteriovenous connections and the resultant large shunts. Consequently, early neonatal presentation is usually associated with very large malformations and VBS with 100% mortality in the absence of any intervention. Presentation at a later age is usually due to lower flow fistulae and is primarily due to cerebral venous hypertension. The rather poor prognosis of neonatal VGAM makes early diagnosis imperative. It has become possible to detect most of the larger malformations with antenatal ultrasonographic examinations in the third trimester of pregnancy. Intrauterine MRI can confirm the diagnosis and delineate the anatomy further. Prenatal diagnosis can facilitate delivery under controlled conditions and immediate postnatal therapy to minimize heart failure and optimize the timing of surgical intervention. In the postnatal period, the diagnosis is suspected with a normal cardiac anatomy in the presence of refractory cardiac failure. A cranial bruit may be heard in some cases. The echocardiogram shows a high-velocity continuous forward flow in the arch vessels and in the superior vena cava with diastolic flow reversal in the descending thoracic aorta pointing to a low peripheral resistance bed introduced by the arteriovenous malformation. Cranial ultrasound establishes the diagnosis demonstrating the venous sac as an anechoic structure located posterior to the third ventricle with pulsatile flow within it. It also provides information about associated venous anomalies, hydrocephalus, and hemorrhage. The diagnosis may be confirmed, and the anatomy further clarified for an endovascular or surgical intervention with either noncontrast CT or MRI of the head. It is essential to avoid doing a contrast CT to confirm the diagnosis as this leads to further brain damage and deterioration in these fragile children. Favorable results with microsurgical management involving craniotomy and clip occlusion of vessels are limited to just 15% of cases across all age groups. Several factors are responsible for these poor results including the deep-seated nature of these lesions and poor myelination of neonatal brain parenchyma rendering it liable to tears during retraction along with the high operative risk in these neonates with multiorgan dysfunction. 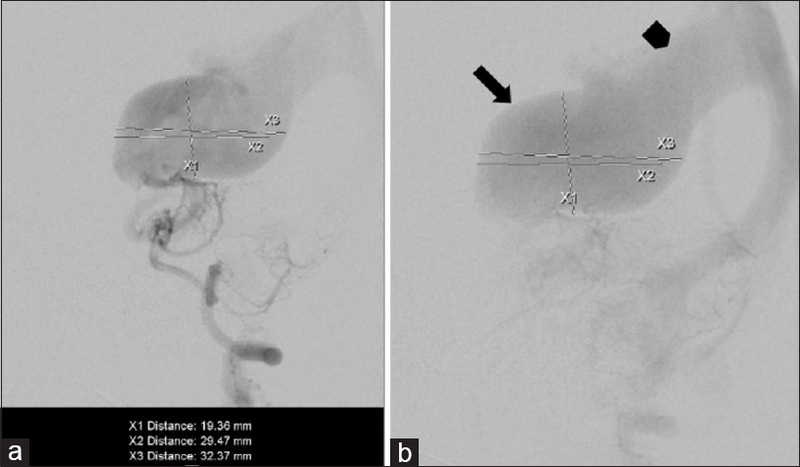 Endovascular embolization in the management of VGAMs has led to a remarkable improvement in outcome in these patients. In a recent systematic review of 667 patients who underwent endovascular embolization between 1987 and 2014, 68% had a good outcome and 31% had a poor outcome, including 10% who died. Embolization in a neonate, however, is a high-risk procedure. Alvarez et al., who have the largest experience in managing these lesions, have given a 21-point scale for determining the timing of endovascular intervention in neonates. The lower the score on a scale of 1–21, the worse the prognosis. Patients with score below eight are considered to have too poor a prognosis to be considered for any intervention. Our patient had a score of nine making her a candidate for emergency embolization, though the prognosis was still estimated to be poor. In the largest series reported by Lasjaunias et al., about one-third of neonatal patients were deemed to be unsuitable for intervention because of poor general condition. Of the 88 neonates who underwent embolization, 36.4% are alive with normal neurologic development, 54.5% have a moderate degree of psychomotor maldevelopment, and 9.1% have a severe degree. The overall mortality in this age group was 52%. In a recent separate review, 32.7% of neonatal patients were reported to have good outcomes with normal development or mild developmental delay. The mortality rate was 35.6% among neonates while the remaining 31.7% had a “fair” outcome, with moderate or severe developmental delay. Some interventionists feel only partial occlusion of the shunt should be done in a single session. Complete occlusion has been observed to be detrimental in some cases due to normal perfusion pressure breakthrough in previously underperfused areas and consumptive coagulopathy with consequent bleeding complications. Complete occlusion of the shunt with staged procedures is recommended. In our case, partial occlusion was done with spontaneous thrombosis of rest of the venous sac. The corresponding author has seen four neonates with VGAM, three of whom had VBS. Despite that, embolization was attempted in all these neonates. However, all three neonates with VBS had unsatisfactory result in terms of flow into sac and died of different complications. VGAM presenting in a neonate with refractory heart failure carries grave prognosis if left untreated. Heart failure in the absence of structural heart disease with exaggerated Doppler flows in the cranial vessels should suggest the diagnosis that can be confirmed quite easily by cranial ultrasound. It is important to avoid a contrast CT scan in these neonates. Many of these neonates have VBS diminishing the chances of success with endovascular therapy. However, an occasional patient like ours should be diagnosed early and referred to centers capable of carrying out interventional procedures. Lasjaunias PL. Brain and spine AVMs, vein of Galen malformation. Treatments and embryological considerations. Interv Neuroradiol 2003;9:263-72. Gold A, Ransohoff J, Carter S. Vein of Galen malformation. Acta Neurol Scand Suppl 1964;40 Suppl 11:1-31. Berenstein A, Fifi JT, Niimi Y, Presti S, Ortiz R, Ghatan S, et al. Vein of Galen malformations in neonates: New management paradigms for improving outcomes. Neurosurgery 2012;70:1207-13. Recinos PF, Rahmathulla G, Pearl M, Recinos VR, Jallo GI, Gailloud P, et al. Vein of Galen malformations: Epidemiology, clinical presentations, management. Neurosurg Clin N Am 2012;23:165-77. Raybaud CA, Strother CM, Hald JK. Aneurysms of the vein of Galen: Embryonic considerations and anatomical features relating to the pathogenesis of the malformation. Neuroradiology 1989;31:109-28. Kothari SS, Naik N, Juneja R, Saxena A. Aneurysm of the vein of Galen in neonates: Report of four cases. Indian Heart J 2001;53:499-502. Khullar D, Andeejani AM, Bulsara KR. Evolution of treatment options for vein of Galen malformations. J Neurosurg Pediatr 2010;6:444-51. Horowitz MB, Jungreis CA, Quisling RG, Pollack I. Vein of Galen aneurysms: A review and current perspective. AJNR Am J Neuroradiol 1994;15:1486-96. Yan J, Wen J, Gopaul R, Zhang CY, Xiao SW. Outcome and complications of endovascular embolization for vein of Galen malformations: A systematic review and meta-analysis. J Neurosurg 2015;123:872-90. Alvarez H, Garcia Monaco R, Rodesch G, Sachet M, Krings T, Lasjaunias P, et al. Vein of Galen aneurysmal malformations. Neuroimaging Clin N Am 2007;17:189-206. Lasjaunias PL, Alvarez H, Rodesch G, Garcia-Monaco R, Ter Brugge K, Burrows P, et al. Aneurysmal malformations of the vein of Galen. Follow-up of 120 children treated between 1984 and 1994. Interv Neuroradiol 1996;2:15-26.